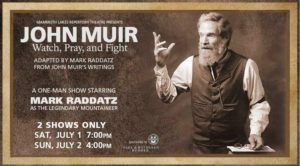 Mammoth Lakes – John Muir: Watch, Pray, and Fight, a one-man show starring Mark Raddatz as the legendary mountaineer, naturalist and founder of the Sierra Club, will be presented by the Mammoth Lakes Repertory Theatre at Edison Theatre for two nights only, Saturday, July 1 at 7 p.m. and Sunday, July 2, at 4 p.m.
Of this project, Raddatz said, “During my lifetime, I’ve noticed popular culture has tended to tame John Muir, to rub the rough spots smooth and portray him as a warm and fuzzy eccentric; someone to take to our hearts, but not take too seriously. He was no Disney character chatting with the birds and squirrels; what Muir had to say back then is startlingly meaningful even now.” The audience is treated to the poetry, wit, insight and passion that made John Muir the most effective voice for preservation in his own time and a remarkably pertinent voice in ours. Raddatz portrayal is thoughtful, thorough and humorous—all to make a very entertaining evening. Mark Raddatz is a professional actor who has appeared in television, movies, numerous Shakespeare festivals, and many theatre productions. His roles have included the Reverend Shaw Moore in Footloose, Malvolio in Twelfth Night, Matthew Harrison Brady in Inherit the Wind, Jack Manning in Angel Street, Horace Vandergelder in The Matchmaker, the Duke in The Merchant of Venice, Claudius in Hamlet, Baptista in Taming of the Shrew, Henry Higgins in both Pygmalion and My Fair Lady, King Arthur in Camelot, Arnolphe in Moliere’s School for Wives, Jud Fry in Oklahoma, Theseus in Midsummer Nights Dream, and many others. He was producing artistic director of Actor’s Repertory Theatre of Sedona where he directed numerous shows. He has been technical director, properties designer and set designer for various theater companies. Tickets are available online at www.MammothLakesRepertoryTheatre.org for $20 general admission, $18 for seniors and students, or $22 at the door (sorry, no discounts). WHEN: July 1 & 2: Saturday at 7 p.m., Sunday at 4 p.m. The Mammoth Lakes Foundation offers free education (books and tuition) to any Mono County resident and/or high school graduate who pursues an AA degree at Cerro Coso Community College and provides year-round theatre programming at Edison Theatre. For more information or to make a tax-deductible donation, please contact the Foundation at (760) 934-3781 or visit MammothLakesFoundation.org. Our nonprofit work is only possible through your generosity.